Categorized as: Stories on September 14, 2013. 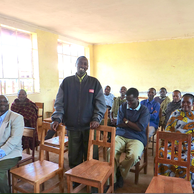 Part 2 shows how the Bacho village residents used their new primary school as a base for the community to meet and plan to renovate the secondary school and create microenterprise jobs for the adults. Meet two girls: Patricia, who intends to stay in Bacho and be a pediatric nurse, and Happiness, who’s going all the way to the Tanzanian president’s office. Editor’s note: Correction to the “Karimu Kids” series: We reported in error in Part 1 that the residents of Bacho, Tanzania live on $1/day. The community survey funded by Karimu International revealed that whole families were earning about $1/day as of 2009. Given an average family size of five, that translates to 20 cents per person. 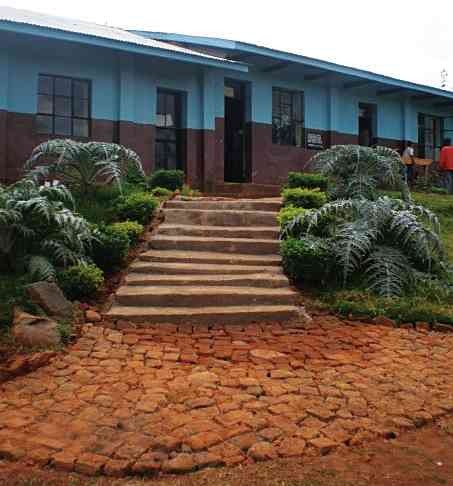 Bacho, Tanzania: So, there sat Ufani School, atop a grassy knoll with its bright blue walls shining and glass windows glinting in the East African sun. The teachers could work in a solid building, and the students could prepare to pass their secondary school entrance exams at extraordinarily high rates for rural Tanzania. Yet, that wasn’t enough. Tanzania’s commitment to primary education has resulted in nearly all of its children enrolled, but only through elementary school. * Traditionally, the bulk of adults (82% of the workforce, out of 45 million residents) have worked the land as farmers; but Bacho youth wanted more career choices than that. This recently democratic country—which gained independence from Britain in 1964 and held its first free elections in 1995—remains the tenth poorest nation on the planet. In remote areas such as Bacho, one has to build prosperity from the ground up. *UNICEF cites a 98% net enrollment rate for primary school; that number falls to 25% for secondary. What happened next in Bacho was that the school became the center for community conversations about their own development. Together with local Karimu board member Joas Kahembe and founders Marianne Kent-Stoll and Don Stoll, everyone from the town council members to parents of the schoolchildren, most of whom never had the chance to complete primary school, convened an ongoing dialogue to answer this question: What do you need? Basing their philosophy of grassroots development on such studies as The White Man’s Burden and The End of Poverty, the Karimu team studied economic theory, but they always deferred to the priorities of the villagers. Priority #1 soon became clear: rebuilding the secondary school to enable bright students like Patricia and Happiness, profiled below, to continue their education past the eighth grade. Caring for these students included supporting their families, too: not just because they are young and reliant on them, but because their African culture instills in them a strong connection that surpasses individual ambition. 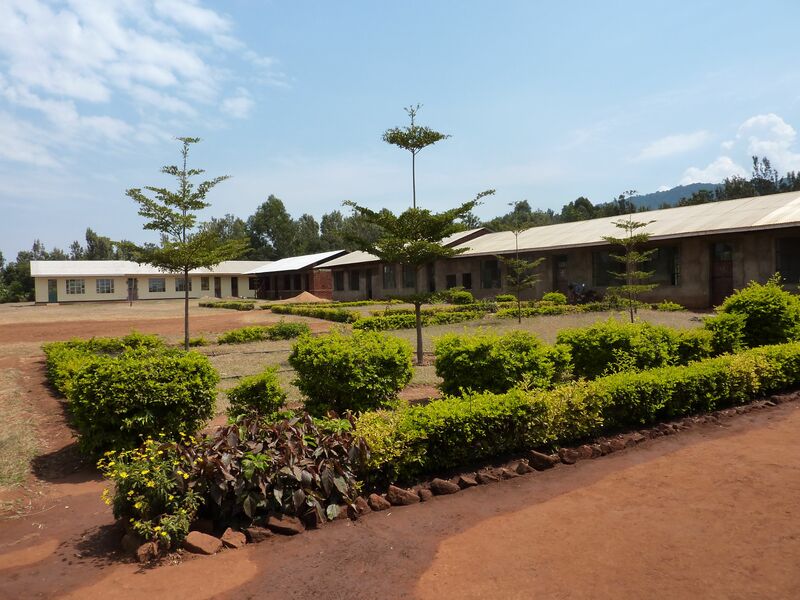 Karimu rebuilt the secondary school as promised. They also organized microenterprises for HIV positive parents to launch a chicken farm, farmers to plant rotating crops, and Ufani elementary students to install a school garden, and donated malaria bednets and fuel-efficient cookstoves. See the list at the end of Part 2, and read the latest Karimu newsletter (attached) for more details. As the years passed, it didn’t take long for the kids of Karimu to begin dreaming of a future beyond the family farm. Patricia Baran carries herself with the height and stature of an eldest child—she has three little sisters and four little brothers—but with a bashful shyness that surpasses many 16-year-olds. She blushes when asked to talk about herself. She looks down at her lap and picks at her fingernails and blue skirt. “My favorite subject is math,” she whispers. She admits she gets high grades in math, but “history is challenging for me.” She enjoys languages, studying Swahili and English, having grown up speaking the language of the local Iraqw tribe before taking on the formal languages of Africa and business. Here in Tanzania, many public-school students aren’t exposed to English until secondary school; the Bacho teachers believe this puts young people at a disadvantage when testing for high school and college admittance, so they begin at an earlier age. 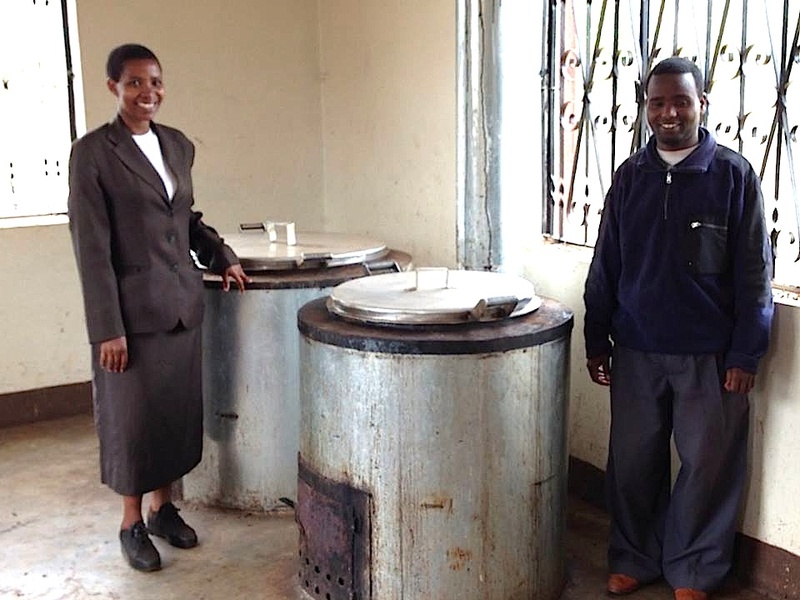 The family used to cook over an open fire, until this year when they acquired a rocket-stove. Patricia will now get to prepare family meals without smoke in her eyes. “I am happy when I am cooking with my mother,” she smiles softly. When she’s doing chores such as weeding the garden, peeling vegetables, or stirring the ugali(a porridge made of corn meal), Patricia thinks about how she wants her life to be different from this. However, Patricia envisions a different sort of marriage than the one her mother has. While she sees a lot of care between her parents, “my husband and I will respect each other” as equals, she says gently. Like many of the children we meet in Bacho, Patricia has a deep connection to her family and highly developed nurturing skills. She has a younger sister (age 14) with mental problems, and perhaps that’s made her more empathic. Her career goal?—“to be a nurse for children.” As she runs back outside to play with the younger students and her siblings, that’s easy to imagine. One of the smallest girls in the Ufani School, delicate Happiness Frank, wants to be the executive officer (i.e., mayor) of her village when she grows up. She clasps her hands behind her and looks up shyly at first. But once you’ve talked for just a few minutes with this tiny fifth-grader, her ambitions really shine. “My favorite subject is Swahili, and I struggle with math,” she says. “I get pretty high marks, but I want to study more.” Happiness does chores at home: she helps clean house and washes dishes. But there’s a lot of her name in her: Rather than doing her homework, Happiness loves spending hours skipping rope with her three best girlfriends. She also sings in the school choir. Happiness can’t remember anything difficult happening in her nine years of life thus far. She says her family of nine—mother, father, three girls, and four boys—have no health issues, although her teacher, Mr. Daniel Amma, notes that her mother had malaria just this year. He thinks she may have forgotten. “Playing makes me the most happy of anything,” she says quietly, her big eyes shining brightly. While she’s busy being a kid, Happiness is planning her perfect future: “I’m going to have a good, big house, with an upstairs and with cars. I’m going to be a plantation owner.” Here in the Manyara region where she’s grown up, her farm could grow quite a variety, from coffee and bananas to mangos, yams, and maize. Travel to Tanzania without leaving your chair: View Part 2 of “Until We Meet Again” below, or by clicking the link here. DONATE directly to give more students like Patricia and Happiness a world-class education; or join Karimu’s hands-on work in Africa here. Photographs by Suzanne Skees and Peggy Seltz. Video “Until We Meet Again, Part 2” by award-winning documentary filmmaker Peggy Seltz.